Thrifty Thursday Vol. 37: Time to Fill Another Space! 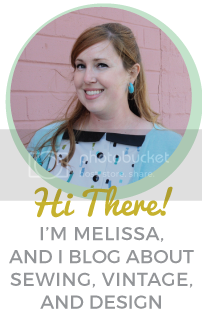 Hello, welcome to this week’s Thrifty Thursday, where I share my thrifting finds from the week. After taking a break for a little while, I’m definitely back to thrifting regularly, because I have some exciting news…we’re getting another space! On Monday, Phillip and I signed up for second space in the antique mall we sell at. Our first one is getting pretty crowded- to the point where it’s hard to really display a lot of the items properly. We still have some small furniture pieces at the house, as well as a ton of vintage suitcases, and we also will be selling some pieces for an older lady we met, so it just seemed like a necessary step. We’ll be moving our stuff in on May 1st, so we’re scrambling to find some more book shelves to put things on. We’ll probably try to hit up some yard sales this weekend and see what we can find. It’s crazy that we just started selling here less than six months ago and now we’re already expanding to another space! I’m a little nervous about it, but much less so than I was about the first one, because we’ve made a profit every month so far. Anyway, I know that if we end up losing money with the second booth we can always go back to having just one space. A Jamaican souvenir doll (the third one we’ve found! 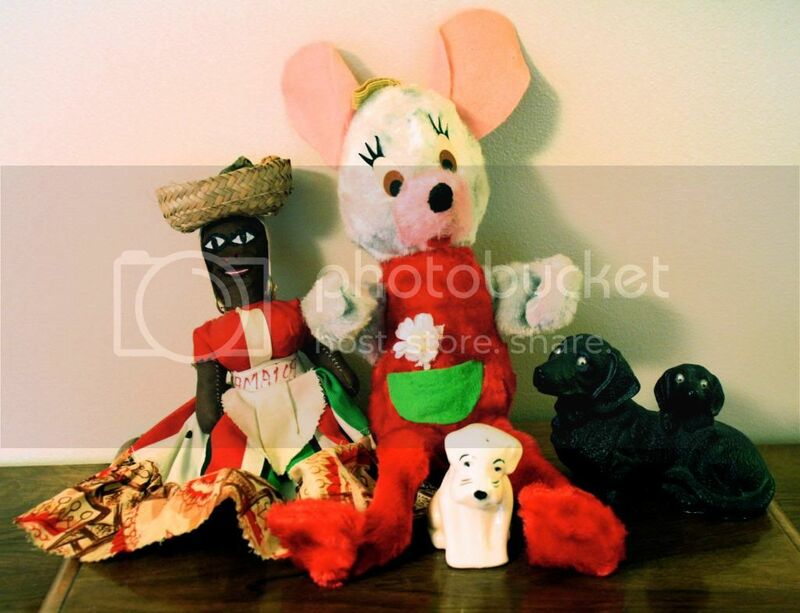 ), a funky sixties stuffed mouse, which has a bell inside of it, a little dog shaker (no sign of it’s mate), and a carved coal dachsund statue with the funniest googly eyes. Phillip found me this leaf-shaped California pottery box, which I’ll be keeping (at least for a while). Yes, I have a problem. 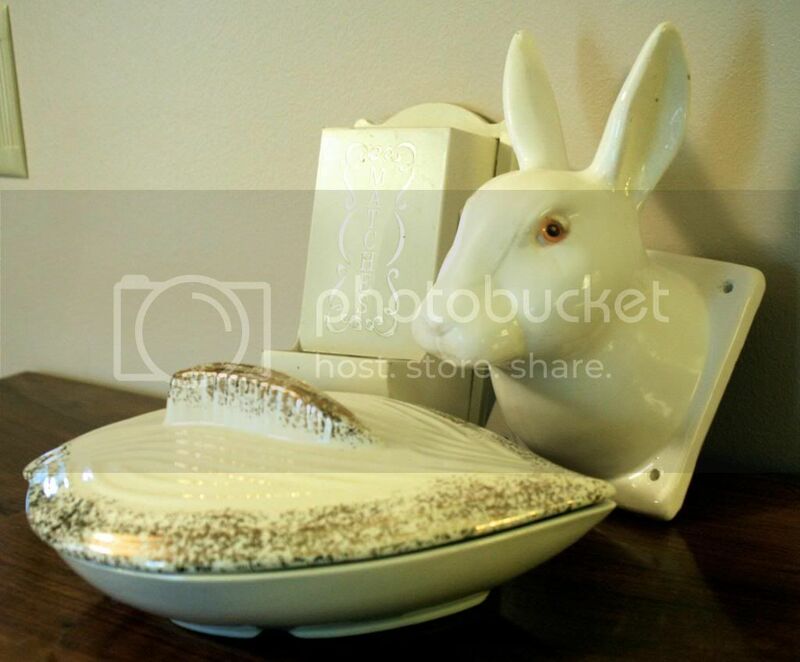 I found the ceramic rabbit head at New Image along with the match holder. They’ll both be headed for the antique space. 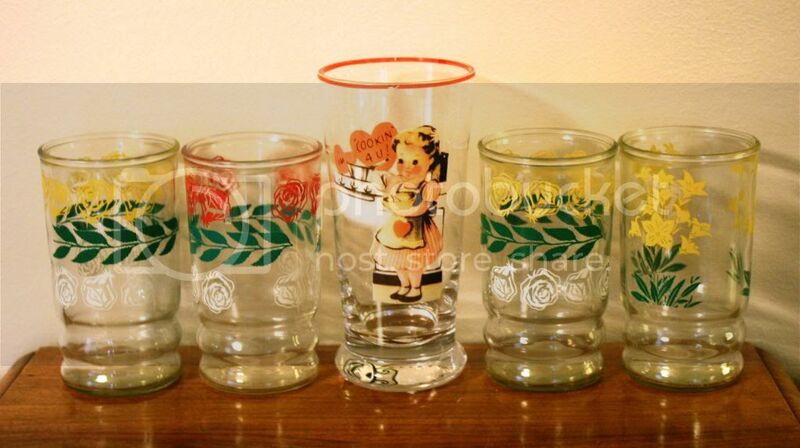 These cute juice glasses were another New Image find- for 60 cents each. We found the glass in the center at the Goodwill in Santa Maria. It’s not technically vintage but I think it will fit in well with the other things we have. 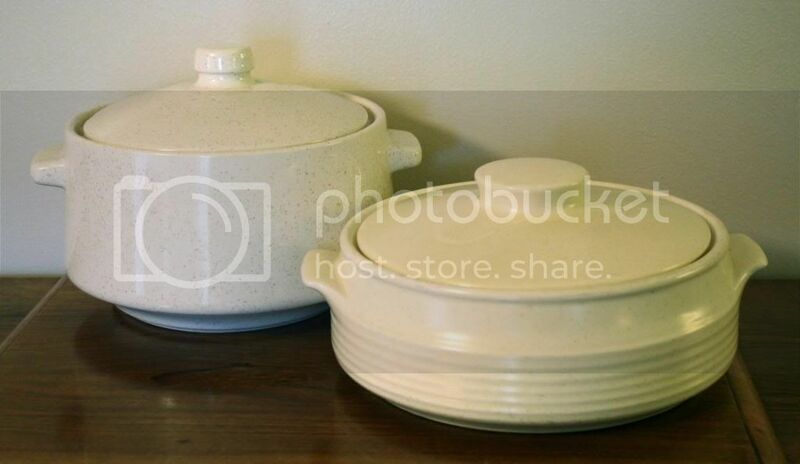 I found these two California pottery casserole dishes at the Goodwill in Grover Beach. They both have that speckled glaze I love! However, they’re both headed for the space. 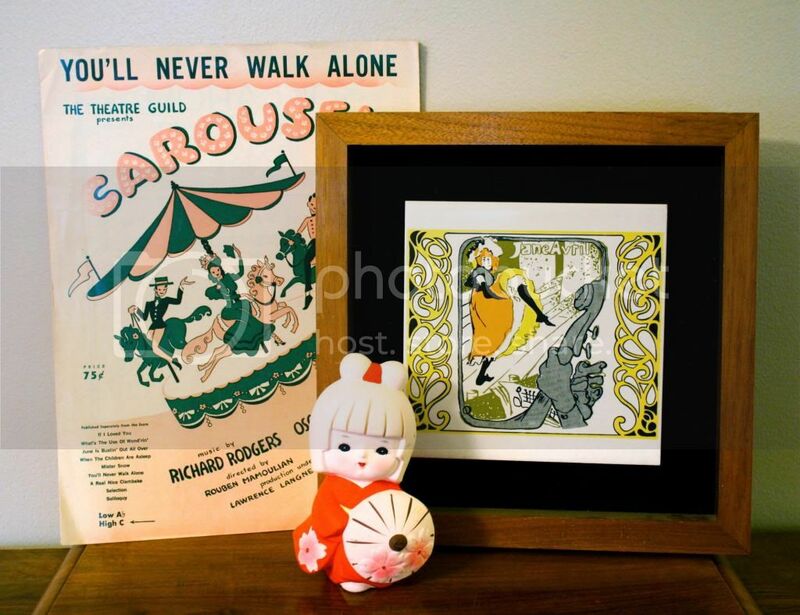 I found this “Carousel” sheet music at Shamrock Thrift for 25 cents. I love the colors and the graphics and I think it would look great framed for a child’s room. 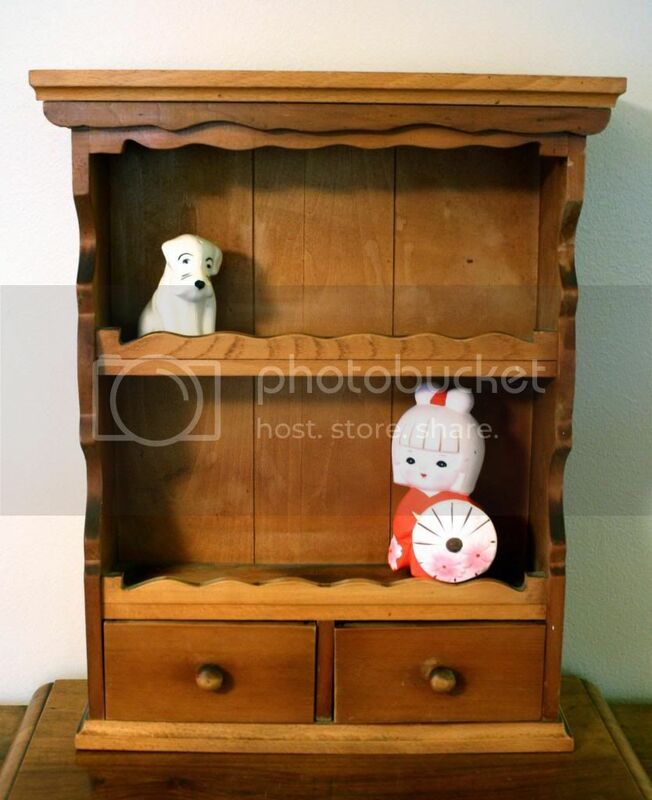 The little Japanese girl is from Family Thrift- she cost a whopping $3 but I thought she was too cute to pass up. Phillip found the framed tile at the R.A.D. Thrift store in Santa Maria. I was excited to find this cute little shelf/spice rack at New Image. It’ll be a great display piece for the space! I think I’ll fill it up with salt and pepper shakers. 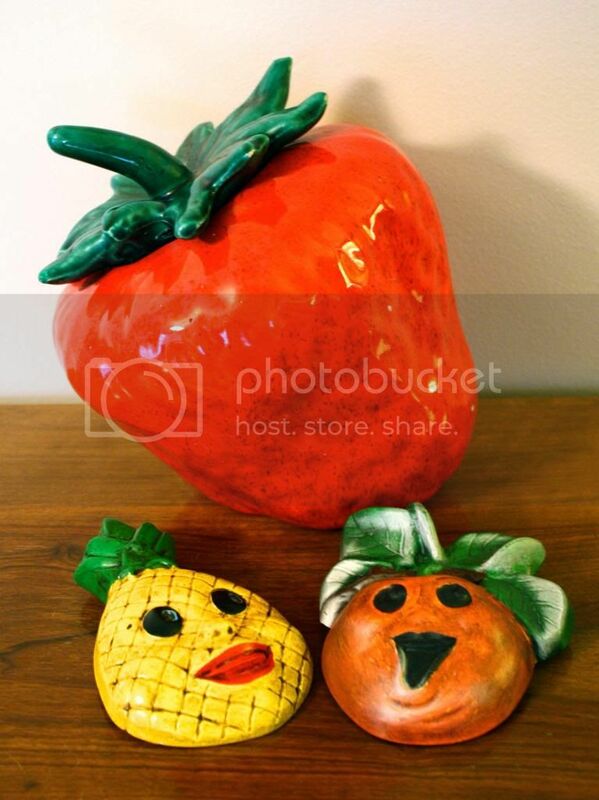 Fruit-themed items have been selling well in the space, so I couldn’t pass up this strawberry cookie jar and these little chalkware fruits. Yay! 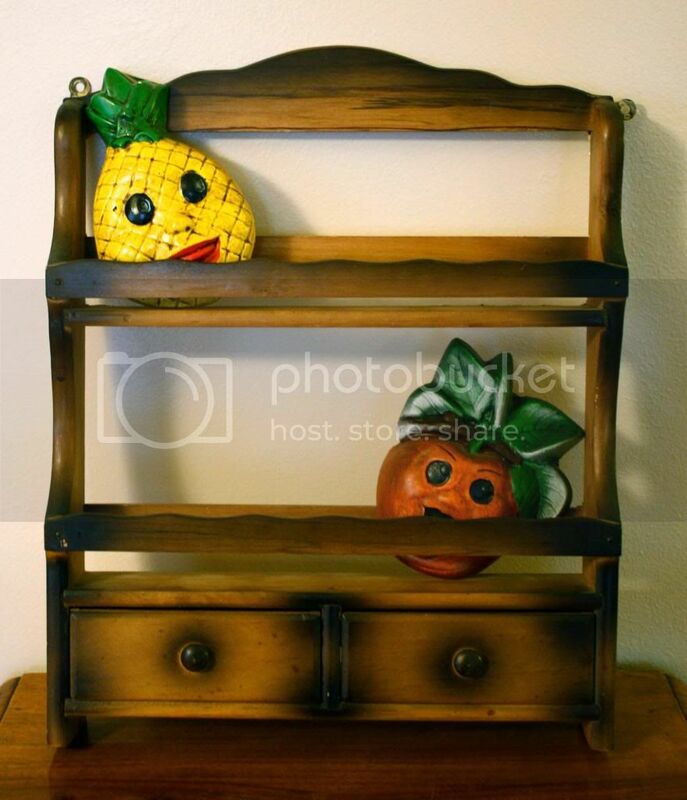 I found yet another spice rack with some great airbrushing. Another great display piece and people love them! 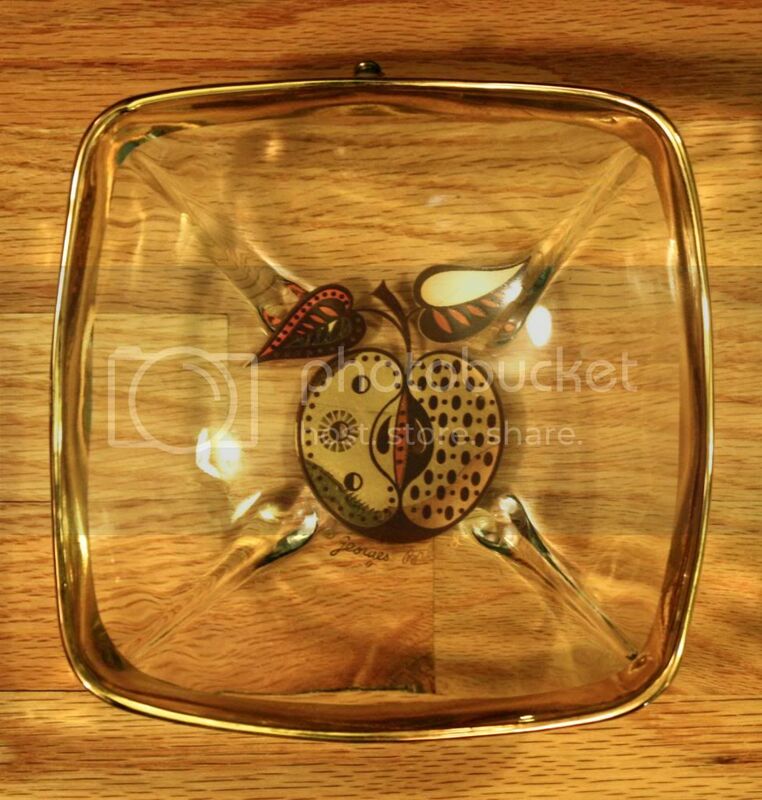 Phillip found this cool apple dish. I’m still debating whether I’m keeping or selling it. 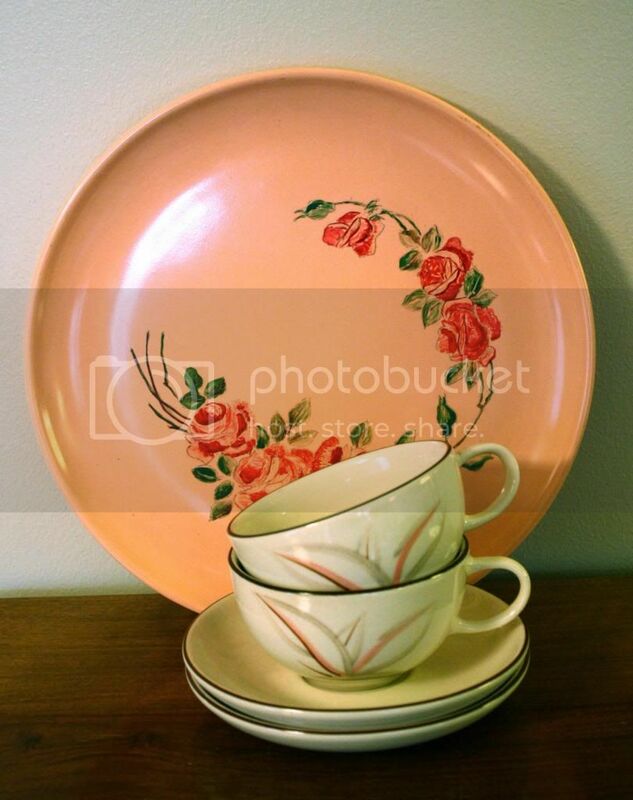 This handpainted rose tray and the Winfield cups and saucers were both found at the Goodwill in Santa Maria. I’m finding a lot of Winfield pieces, so I might make a display of them all together in the new space. PS: If you see any items you like, they may be listed on Phillip’s Ebay account, so take a looksie!